I was 7-years-old when I started sweetly asking IHOP waitresses for coffee. After my, “Coffee please,” they would quickly glance at my mom or dad, who would nod their head that yes, they allowed their little girl to drink a legal addictive stimulant. The waitress would glare at my parents while pouring me my cup of coffee while I merrily popped open creamers and sugars and stirred them in the dark goodness steaming out of the beige mug. I would savor every sip while the waitress contemplated calling CPS. Over time instead of sipping sugar milk coffee, I began to thrive on exquisite cappuccinos. After working as a barista at a legit caffe, I’ve learned the art of making perfect espresso. I’m one of those who before ordering a drink at a coffee shop always has to look at the espresso machine first. If it’s a decent machine I will get a cappuccino. If not, I’ll get some sugary chocolately concoction since they most likely can’t make the espresso that makes my heart sing. So when I went to Thailand, my love of espresso went into hiding for two years. It was very hard to find coffee shops in Thailand that weren’t way over-priced that made good coffee, and after walking down the humid streets, usually the last thing I wanted was a steaming cup of coffee. So my drinks of choice in Bangkok were usually Cha Yen, which is Thai milk tea that has sweetened condensed milk, or iced Thai lemon tea, or iced Thai coffee. I would get at least one of these magical drinks a day. At first I thought every sip of any creamy, sweet bright orange-tinted Thai milk tea was amazing. But as the years went on, my snobby drinking tendencies moved from coffee to Thai iced drinks. My Thai hubby would get annoyed when I would order a Cha Yen, and because they put too much sugar to tea ratio in it, I would wrinkle my nose and only drink a few sips and throw the rest away. 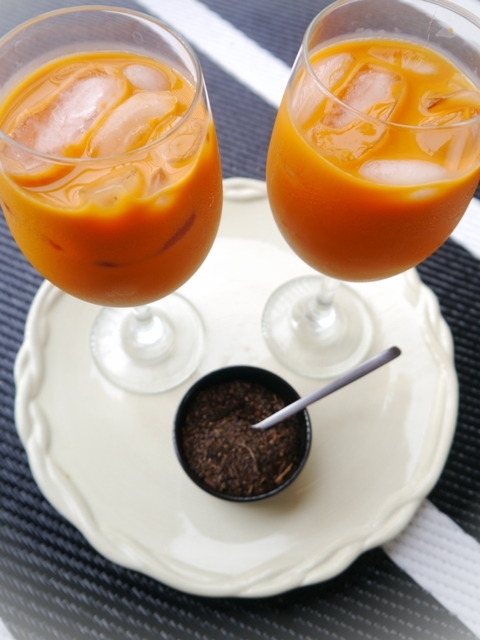 Anyways, I hadn’t tried making Thai milk tea in America until recently. I was at the Asian market when I spotted a Thai Tea Mix hiding on a shelf. And not just the premade sugar, milk, with some tea in it Thai tea packets, but the actual Thai tea leaves. So I bought it, and couldn’t wait to make it. And once I did, I was astonished at how crazy easy it is to make! My Thai hubby thought I was weird, as usual. He had never made Thai tea, like most Thais, why make it when you can buy it on the street made by an expert for a buck? But this is America where you can’t buy it on the street, and when you buy it in a restaurant it’s $3.50 and not that amazing. 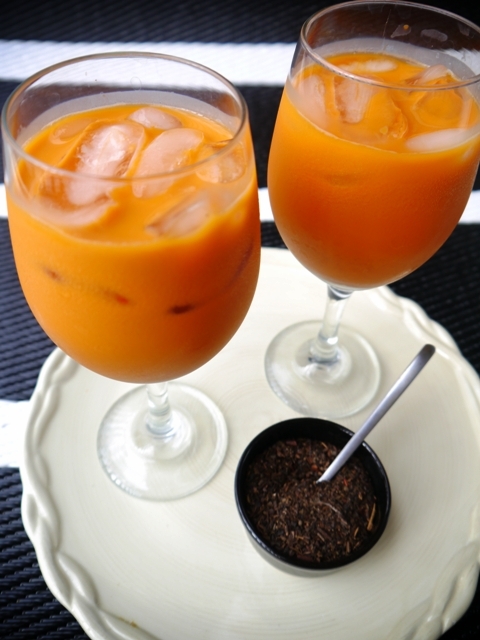 Just like most Thai food, everyone likes their Thai Tea made a certain way. I like mine not as sweet, and more creamy with a strong tea flavor. So for me, I put in sweetened condensed milk, whole milk and no sugar. But how do you like yours? 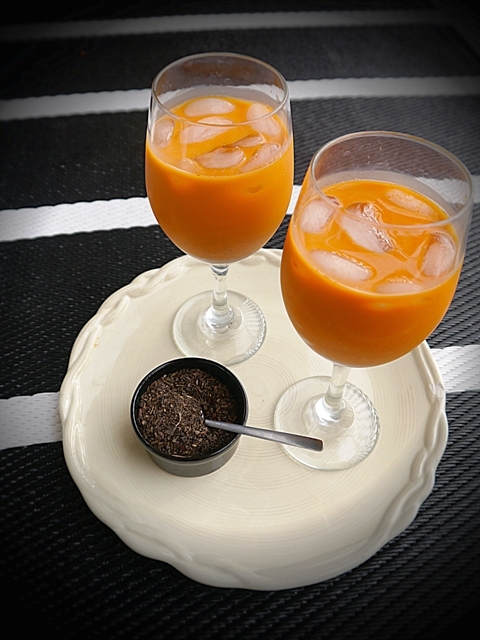 Check out my Thai milk tea recipe, and let me know your thoughts. And what food or drink are you picky about? 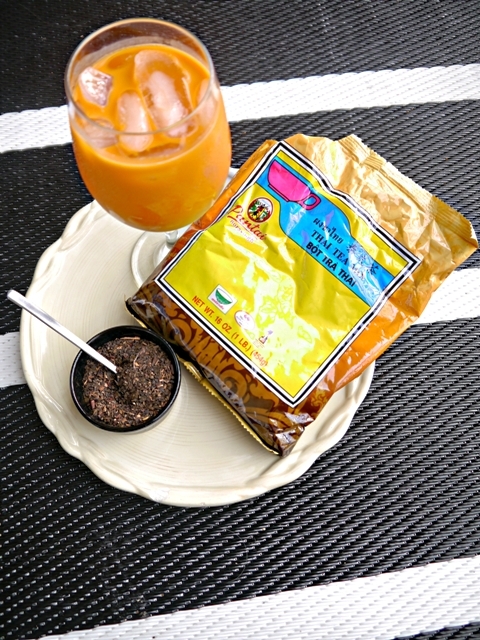 Ever wonder the secret to making Thai milk tea? Discover it here, and make it at home today! Once the water boils, turn it off. 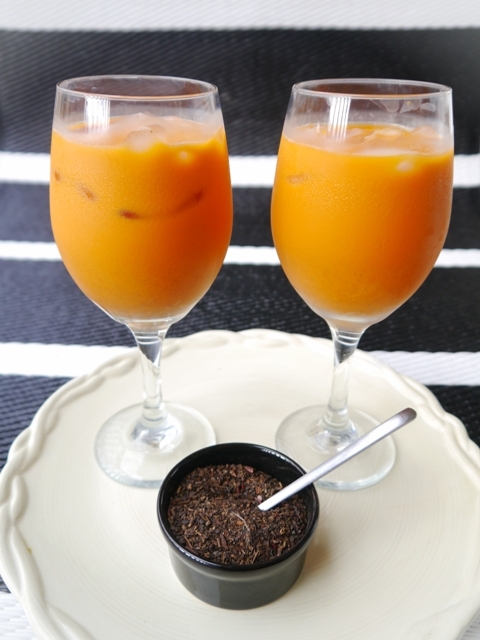 If you have a tea bag, or tea ball, put the Thai Tea Mix in it and place it in the water. If you don't have one like me, just put the leaves straight into the water. Let tea seep covered 3-5 minutes. Take out the tea bag or ball, or use a fine mesh strainer to strain the tea into another pot or bowl. Let tea cool to room temperature. Pour 1 cup of tea into a cup. There will be some tea leftover, which you can top off your tea with later. Add in sweetened condensed milk to taste. Stir vigorously to help it dissolve. I don't add any sugar because I think it's sweet enough from the milk, but feel free to add some if you like it sweeter. Add milk of your choice to taste. Put in ice, stir and enjoy! As you can see, my favorite ratio is 1 cup of Thai tea to 2 tbsp of sweetened condensed milk and 1/4 cup of milk, but feel free to customize the tea to your preference. It's similar to coffee and how everyone like's their's a certain way. It's fun to play around with it and find your perfect concoction. 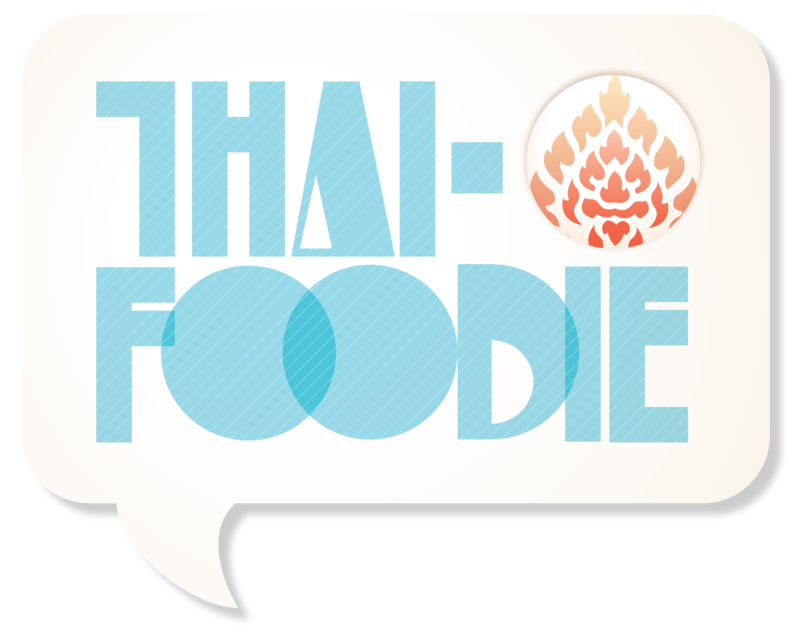 *The links to the Thai Tea Mix are affiliate links, so if you order from it, you will support Thai-Foodie! Yay! You are so sweet! Oh how interesting looking tea!! Yay! Im so glad that I helped complete your foodie life 😉 It’s my pleasure! Hope you enjoy making it at home!